Visit: Over 145 CAA Offices Click: caa.ca/hertz Call: 1-888-333-3120 Hertz & CAA. Where value rules the road. TERMS AND CONDITIONS: Promotional Code (PC#) must be provided at time of reservation or offer is void. Advance reservations are required and must include your CAA Club Discount Code (CDP#), along with the PC# for this offer. Double upgrade valid on Economy through Intermediate 4-door vehicles. Highest obtainable upgrade is to a Premium class vehicle. Offer not valid on Porsche, Mercedes-Benz AMG or Dream Cars. Subject to upgrade vehicle availability at time and place of rental; brand and model are not guaranteed. Blackout periods may apply. Modifying your reservation may result in a change in rate and/or invalidate this offer. Rate subject to increase or fees may apply in the event of early/late vehicle returns. Vehicle must be returned to renting location to avoid change in rate or drop charge. This offer is redeemable at participating Hertz locations in Canada, the U.S., Puerto Rico and Mexico. This offer has no cash value, and may not be used with Prepay Rates, Tour Rates, Insurance Replacement Rates or Hourly Rentals. This offer may only be used with a CAA CDP# and cannot be combined with any other certificate, voucher, offer or promotion. Hertz age, driver, credit and qualifying weekend and weekly rate restrictions for the renting location apply. Taxes, tax reimbursement, age differential charges, fees and optional service charges, such as refueling, are not included. No credit or refund for unused fuel on Fuel Purchase Option. At the time of rental, present your CAA Membership card or Hertz/CAA Discount Card for identification. This offer is valid for vehicle pickup on or before 1/31/15. Discounts and benefits are available at all Hertz corporate and participating licensee locations in Canada and the U.S., and are subject to availability. Savings in CAD or local currency equivalent. Only CAA Members with a Gold enrollment date on or after 2/1/12, who elect to participate in the Hertz Gold Plus Rewards program will qualify for a free rental day after the first Gold rental. Go to: caa.ca/HertzGold to enroll. Premier Members must enroll at: caa.ca/HertzPremier. Reg. U.S. Pat. Off. 2014 Hertz System, Inc. CAA and CAA logo trademarks owned by, and use is granted by, the Canadian Automobile Association. 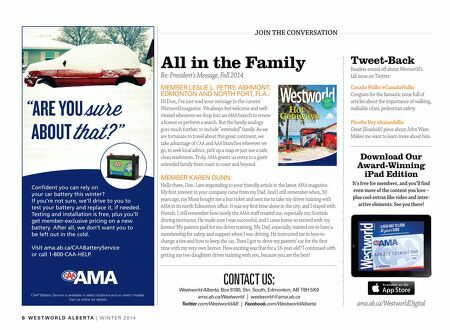 ™ CAA Rewards is used by the Canadian Automobile Association. hertz.ca CAA Member-exclusive discounts and benefits: • Everyday discounts of up to 20% on daily, weekend, weekly and monthly rentals! • Hertz NeverLost GPS rental for $6.99 per day, a savings of $6 per day! • Additional qualified CAA drivers are FREE, a savings of $13 per day per driver! • FREE use of a child, infant, or booster seat, a savings of $11.99 per day! • Hertz Gold Plus Rewards membership and a FREE rental day! CAA Members get a FREE Double Upgrade on weekend and weekly rentals of Economy through Intermediate size vehicles by including Promotional Code #202720 in your reservation. 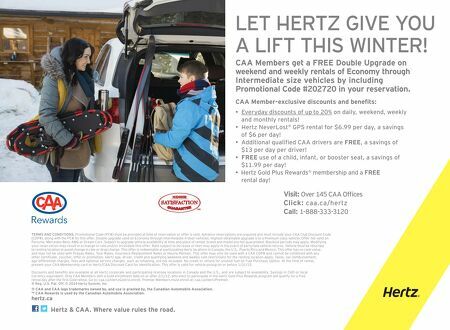 LET HERTZ GIVE YOU A LIFT THIS WINTER!